Alarm clocks continue to be re-invented and improved to go far beyond just telling time and waking you up at your desired time. Many of the best alarm clocks have additional features such as controlling the light in your room and being able to access Wi-Fi. However, despite all the additional features, people still use them for their primary function which is to wake you up whether this is for work, an appointment, to wake up from a nap or a host of other reasons. This is a very saturated market with hundreds of available models which can make it hard to discover what the top rated alarm clock is, which is why we’ve dedicated a full guide to the topic so you can efficiently work out which alarm clock is the most suited to your needs. This outlet powered projection radio alarm clock is compact and lightweight so it can easily fit on your bedside table without taking up too much space. The alarm clock has a projector feature on the top of the unit which can project the numbers on ceilings or walls. This makes it easier to read the time, so you don’t have to twist your neck to see the clock time. The clock has a large 5-inch display with big numbers which makes it easier to read from a distance. The display also has three different brightness settings while also having a dimmer setting so the screen can be brighter during the day and softer throughout the night, so you aren’t disturbed during your sleep. If you enjoy listening to the radio, then you can not only do this but also have up to 15 preset radio stations. In addition, there is also a sleep timer function so you can fall asleep with the radio on in the background. If you share a room with another person, then this clock will allow you to set dual alarms with two different sounds, and the inbuilt snooze function enables you to snooze between 5-60 minutes. Supplied with each alarm clock is a 45-day money back promise and also an 18-month warranty to protect you if any faults develop with the product. Lumie is not new to creating products and have been designing light therapy products for over 25 years in the UK. 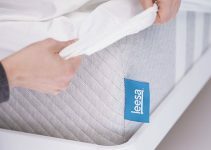 Their products are backed by scientific research, and they were the inventors of the original wake up light in 1993, so you can see they have some serious experience. 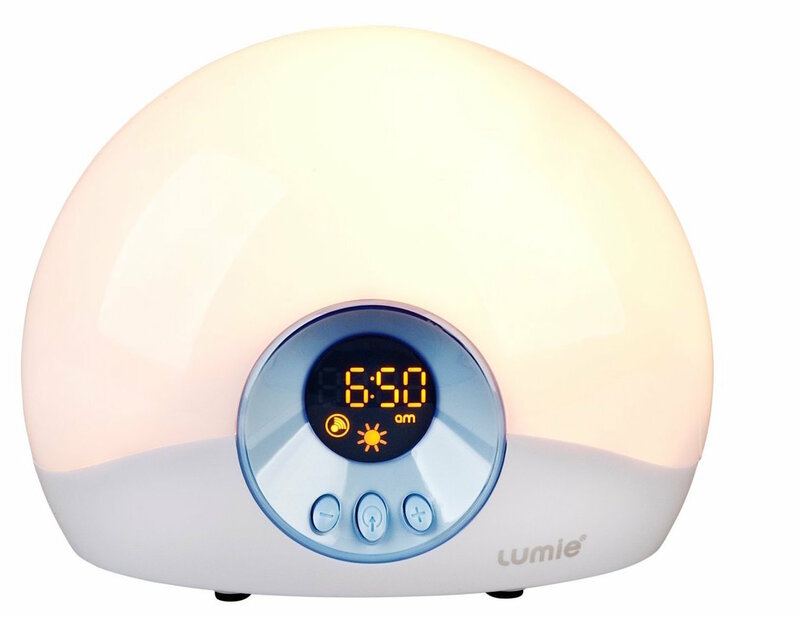 The Lumie alarm clock is ideal for those who want to be woken up with natural light that gradually brightens which gives you a more effective morning routine. The clock has a sunrise setting which lasts 30 minutes with a soft glow which then gradually reaches full brightness. Waking up this way has been linked to feeling more refreshed allowing you to stay more alert and energised throughout the day. This is because light triggers your body into creating cortisol and having a healthier sleep cycle. This clock is also great for winding down to go to sleep at night using its fading sunset feature which triggers your body to produce melatonin which helps you to fall to sleep quicker. The clock also has a dimming bedside light, a backup alarm and a snooze function. The alarm clock also comes with a 3-year warranty for added peace of mind security. If you’re looking for a simple yet effective digital alarm clock, then this could be the solution for you. The clock has a smart-talking function which allows you to touch the top of the clock slightly and it will read out the temperature and time. This means you don’t have to open your eyes allowing you to remain closer to your relaxed sleeping state, so it's easier to fall back to sleep. There is also a light sensor function so the display gradually gets brighter as the environment around it gets darker. This sensor is optional and can be switched off. As you'd expect there is also a snooze feature and a choice of 7 different wake-up sounds. Three different alarm schedules mean that you can tailor the alarm to the days that you need to use it. I.e. you can set your morning alarm only to go off Monday-Friday if those are the only days that you have to wake at that time. 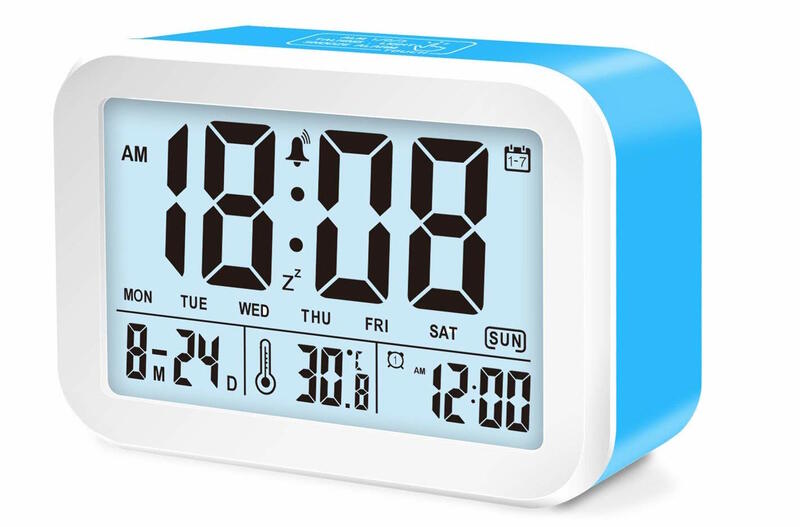 The lightweight alarm clock also has a calendar and shows the temperature which is shown on its 4.5 inch flat LED display. The Musky LED alarm clock brings all the benefits of a standard alarm clock but also has the added functionality and features to make it one of the best on the market. 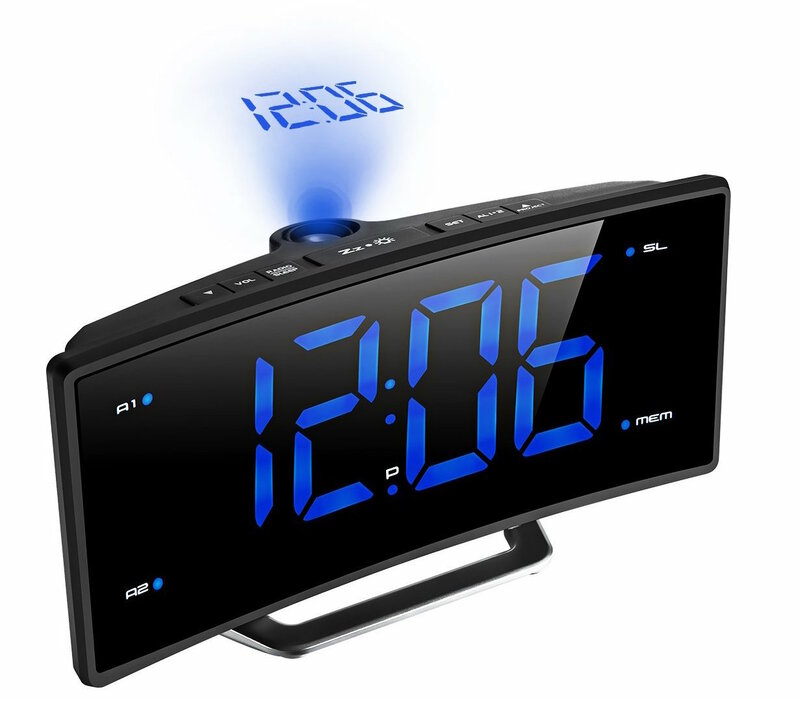 The clock has a LED display which displays the time and has Bluetooth connectivity. 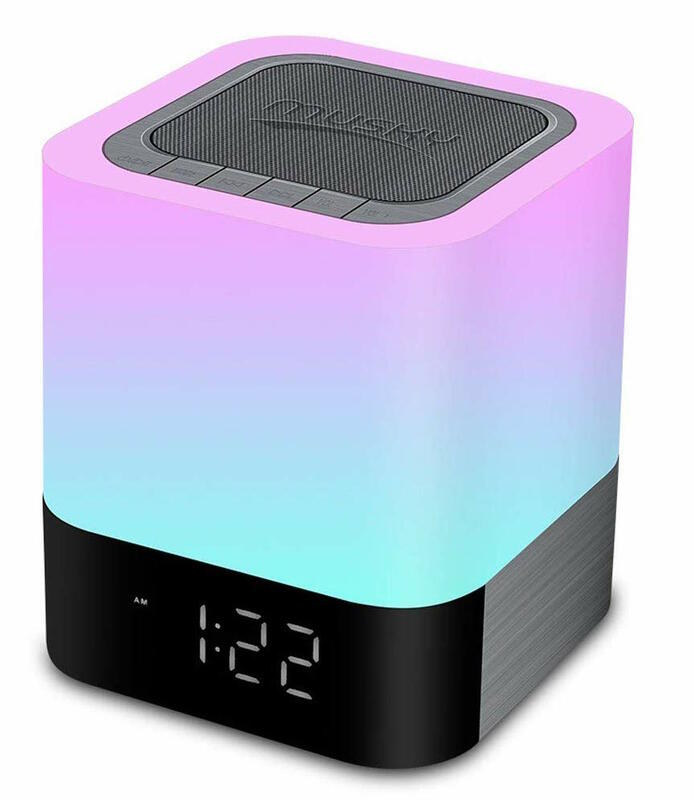 This connectivity allows you to use the alarm clocks speaker to connect to your device whether that be a tablet, smartphone, laptop etc. The clock is compatible with most Bluetooth speakers and also has an AUX input, which makes this clock great for outdoor activities such as camping. The Bluetooth connectivity also allows you to take hands-free calls through the device's speakers. The clock has 48 colour changes and a sleep mode, while you can also control the colour and brightness. 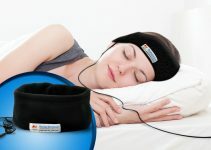 The colours include a soft lamp light which helps users to fall asleep quicker. The 48 colours cycle automatically, but you can also select a specific colour for it to stay on. Powered by a 4400mAh lithium rechargeable battery which gives it long battery life, but it can be charged via USB cable in just 6-10 hours so it can charge overnight while you’re sleeping. There is also a 100% satisfaction guarantee as they offer a free replacement service. 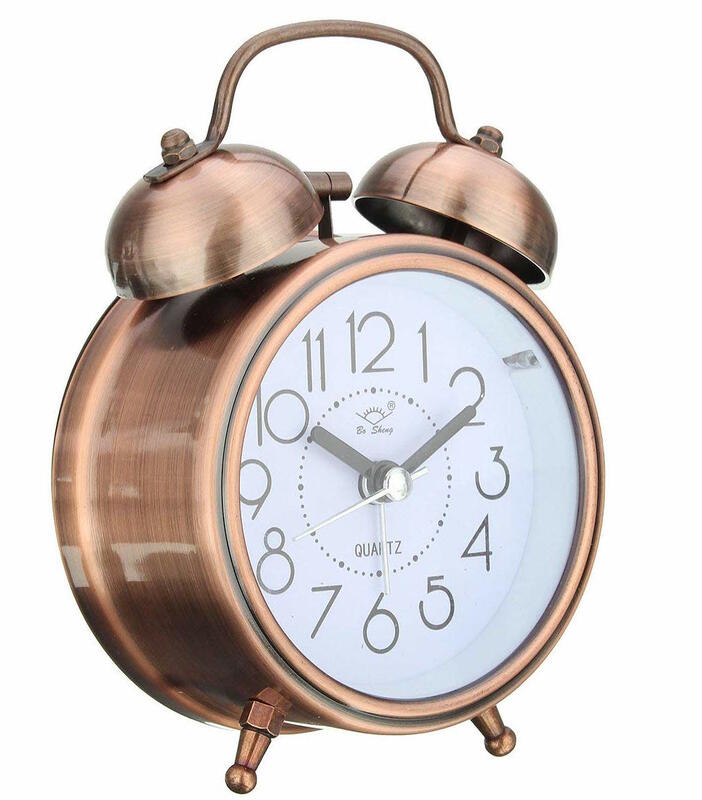 This battery operated copper alarm clock is for those that like a different type of look to their alarm clocks with a more retro feel, while still having the same functionality as the modern looking alarm clocks. The operation of this clock is almost mute so that you won’t be disturbed by any ticking sounds given off by the clock. If you’re someone who finds it easy to sleep through alarms, then this might be the ideal choice for you because this has a metal bell alarm which is very loud. There is also a night light function which allows you to light up the display so you can see the time even in the dark. The clock is small in size so can fit nicely onto to your bedside table or anywhere around your room. Sony is one of the biggest electrical manufacturers and retailers in the world due to its technological advancements and reliable products. 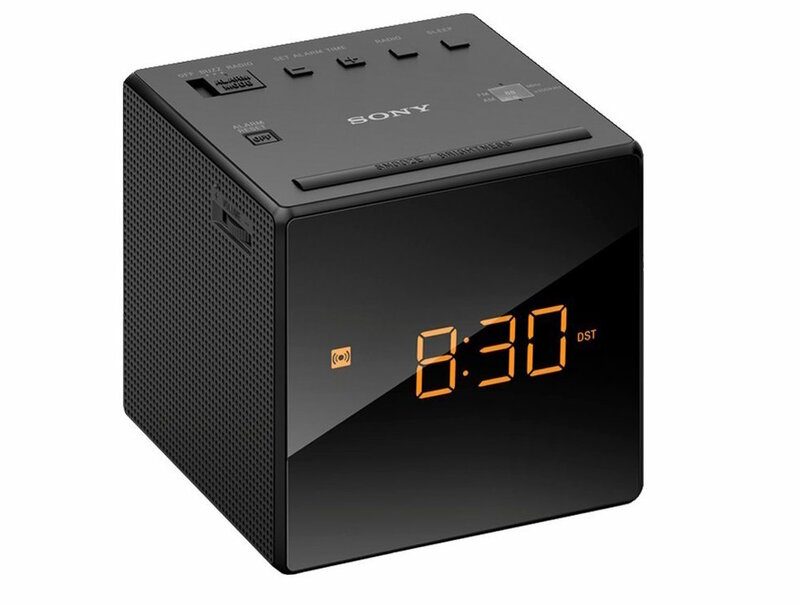 Coming in two choices of colours, this Sony alarm clock radio boasts all the features that you’d expect from a modern day alarm clock with the added aesthetic pleasing cube design. The clock has a single alarm setting which can be either the radio or a traditional buzzer sound, although you can also activate the progressive alarm volume as well as the extendable snooze functions if you don’t want to get out of bed right away. The display has adjustable brightness so you can view it comfortably without being dazed if it’s too bright. The brightness also adjusts year-round to account for summer time adjustment. The unit is mains powered and automatically sets the time when you first plug it in saving you time. There's also a battery back up, so the time and settings will be maintained even if there's a sudden power cut. With the radio function, you can tune in to your desired AM or FM station to listen to your favourite sounds whenever you like. With a slick yet straightforward design this clock won’t look out of place even in the most style-conscious households. The best alarm clocks will have some form of backup battery in operation which means that if there's a power outage, then the settings and alarms that have been set won’t be lost, and your alarm will still be activated. Back up batteries are usually AA or AAA batteries that you can purchase for a low cost. These batteries may not always be supplied with the alarm clock so check on a product by product basis. Dual alarms are an essential feature if you share the same room with another person who also needs to be woken up at a different time. A dual alarm will allow you to set two different alarm times, which means that the first person who wakes up doesn’t need to reset the clock to the other person’s time every morning. Alarm clocks can use a range of different power sources to operate. The most popular are battery powered and mains which need to be plugged into a power source. Power source alarm clocks are the most reliable as they also usually have the capacity for batteries for use as a backup power source for added reliability if there is a power outage. The higher quality alarm clocks allow you to connect your mobile phone or mp3 player via its media dock. This means that instead of using the stock alarm sounds that the alarm clock comes with, you can use your songs. Waking up to sounds you enjoy is much more comfortable, and will make your wake up routine easier especially if you struggle with mornings. There are many different types of alarm clocks that you can choose from. The choice you make will solely come down to personal choice and will be based on functionality, reliability and aesthetics. Digital clocks are plugged into a power source which operates the clock, while they usually also have an LED or LCD which shows the time as opposed to a traditional clock face. Digital clocks are extremely reliable but they will need a power source close by but can also operate on a back-up battery source. Analogue clocks can either have a traditional clock face or be digital and are also reliable at both keeping accurate time and for setting off alarms. Analogue clocks track time by using a quartz crystal made from silicon dioxide. Atomic clocks are the most precise at keeping the time and uses electronic transition frequencies. Atomic clocks come in three different types: Hydrogen, Rubidium and Cesium, however, it’s unlikely that you’ll need to buy atomic clock if you’re using it as an alarm. It’s normal to set the alarm a little earlier than you need to wake so that you can snooze the alarm and sleep for a little bit longer. The snooze button is a very popular feature on an alarm clock, and most people use it more than once per morning. You’ll want to find out about the snooze button features such as how many times you can use it, and the amount of time between each snooze. A sleep timer is useful if you’d like to use your alarm clock to listen to the radio or other music at night. The problem this has is that this same music can wake you up in the middle of the night once you’ve fallen to sleep interrupting your sleep cycle. A sleep timer allows you to set a specific time that you want the radio to turn off. Traditional alarm clocks need the time setting manually when either the power goes out, the clock is unplugged or when you first buy the alarm clock. Newer models can often sync to the correct time automatically by using its internal clock which saves you the effort. The best models can also adjust for daylight savings to ensure that the time is 100% precise. Alarm clocks by nature are straightforward products which means you can expect them to last many years without becoming faulty. However they’re still electrical goods, and by nature, there's still a chance that faults can develop, so it’s important to see if the alarm clock you’re going to buy comes with any warranty period. This will ensure that the manufacturer will either repair or replace the item giving you added peace of mind. The majority of alarm clocks are compact in size and lightweight; however, you need to take this into account especially if there isn’t much space in your room for a clock. Also if you're a frequent traveller, then some alarm clocks are better and smaller for travel than other models. Different people like to wake up to different types of sound where this is loud traditional alarm sounds, ambient noise, their own music choice or just vibrations. The best alarm clocks will come with a range of inbuilt sound options. A range of sounds is also necessary because over time many people get used to hearing the same wake-up sound over and over again, which can lead to them sleeping straight through them as they become more and more immune to hearing it. It's becoming more and more popular that electrical devices have a USB port and alarm clocks are no different, which allows you to charge other electrical devices such as tablets and mobile phones. The volume that you have your alarm at will again come down to personal preference. Some people need the volume at its max because they are heavier sleepers whereas others can wake using a quieter alarm sound. Alarm clocks will often allow you to alter the volume level allowing for the added level of customisation. It’s normal for digital alarm clocks to show more information on the screen other than the time. They can include the current date or temperature. The information on display can often be customised to show only what you want to see. Also, the brightness of the screen can also be adjusted, because some people don’t like the brightness on maximum, especially when sleeping in a dark room as this can disturb their sleep. Some clocks will also automatically adjust to ambient light. What's the Best Way to Wake Up? Although this will come down to personal preference, it’s widely understood that waking up gradually is more satisfying than being startled by a loud beeping sound. In reality, your alarm clock needs to be loud enough only to wake you up, not the rest of the house. It has been proven that waking up in the morning to the sound of the radio has a more positive effect on the brain which sets up for the day in a better mood. There are also alarm clocks that sync to the sunrise and automatically adjust their wake up lights to match this. If this isn’t for you, then you can also have a wake-up alarm sounds that start quiet but progressively louder in volume to ease you awake. What About Just Using My Phone as an Alarm? This can, of course, be done but this means that your smartphone will close to your bed throughout the night which will disturb you whether this be from messages or phones calls that may come through. It's been proven through studies that the light given off from smartphones harms sleep patterns because the light interferes with your circadian rhythm which is essentially the internal clock that your body uses for your sleep cycles. The light emitted from your smartphone differs from natural light because it contains a significantly higher concentration of blue light which makes it harder for you to fall asleep. The best way to avoid this problem is by decreasing the amount of time in front of screens before you finally go to sleep. We know it’s hard for people to do this, which is why many of the newer smartphone models now have a night mode which gently lowers the display brightness throughout the night. Getting into a consistent sleep schedule is incredibly important to your well being, and the best alarm clock can help you do this, meaning you’ll wake up each morning raring to attack the day ahead feeling refreshed.